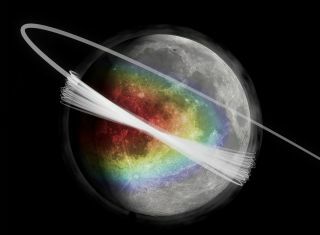 An artist's conception of dust in the moon's exosphere (thin atmosphere). The color shows the amount of material ejected from the surface, with red representing the highest quantity. The orbits show where impactors randomly occur. The arc shows the trajectory of the LADEE spacecraft. The moon is surrounded by a permanent dust cloud likely caused by comet particle collisions, new observations reveal. Data from NASA's Lunar Atmosphere and Dust Environment Explorer (LADEE), a spacecraft whose specialties include dust observations, reveals a dust cloud that is different than what may have been observed by astronauts on Apollo 15 and 17. The crews saw a "glow" on the moon that some believe was caused by hovering dust. "The cloud we identified is comprised of bigger particles and their density is so low that this cloud could not have been noticed by the astronauts." What's more, Horanyi's team suggests that all "airless" bodies in the solar system – including places such as the moons of Mars – would be engulfed by similar dust clouds. That's because they would all be struck by particles from the icy Kuiper belt at the edge of the solar system. A permanent cloud of dust has been found hovering around the moon, caused by the impacts of tiny particles from deep space. See how the lunar dust cloud works in our full infographic. Horanyi first became interested in this question decades ago. In the 1990s, he was co-investigator for a dust detector system (DDS) on NASA's Galileo mission to Jupiter and its moons. DDS found dust clouds surrounding Jupiter's icy moons of Ganymede, Callisto and Europa. "The question naturally emerged if our moon also has a dust cloud generated by the impacts of interplanetary dust particles," he said. Additionally, Horanyi participated in observations of Comet Halley by the Vega Venus spacecraft in the 1980s. "Comets are perhaps the best examples where dust particles coexist with plasmas (electrons and ions), enabling unusual plasma physics to take place," he said. "The surface of the moon has been suggested as another strange place where dust charging, and electrostatic dust mobilization, might go on, so I was hooked early to possibly make these measurements." During that time, about once a week LADEE detected bursts of 10 to 50 particles in less than a minute. This suggested that the particles in those brief events all originated from the same impact minutes before. The effect of dust around the moon was seen by Apollo 17 astronaut Eugene Cernan, who sketched this image of the dust glow during a lunar sunrise, in 1972. Besides the discovery of the cloud, what surprised researchers was seeing the impacts spike during the Geminid meteor shower in December. Rates soared for about 1.5 days around mid-month. "When you on Earth enjoy 'shooting stars,' the same streams of interplanetary dust streams bombard the moon, where – in the absence of an atmosphere – they directly hit the surface and generate secondary dust particles," Horanyi wrote. Further, the density of the cloud is strongest around the moon's morning terminator, or the spot where daylight gives way to darkness. On Jupiter's moons, the dust clouds were more random due to the influence of the gas giant's strong gravity, the researchers wrote. The ejecta, however, is consistent with models of Earth's interplanetary dust neighborhood and observations of phenomena on our planet such as the zodiacal light. As for follow-up observations, Horanyi suggested that an instrument on NASA's new Europa mission could help researchers better understand what happens on the Jovian moons. The surface dust analyzer instrument will be led by the University of Colorado at Boulder's Sascha Kempf, an assistant professor. The research is detailed online today (June 17) in the journal Nature.